The Jeep lineup is stronger than ever for the 2018 model year. The Jeep Wrangler has been redesigned, the Jeep Grand Cherokee has a few new trims including the new Grand Cherokee Trackhawk, and there are four Trailhawk models, which are four of Jeep’s most off-road capable models. While the four Trailhawk models all vary in size and style, there are a couple signature traits all models share. with Engine Stop Start, which is a feature that conserves fuel by turning off the vehicle’s engine when the engine is idling. The 2.4L four-cylinder M-Air engine produces 180 horsepower and 175 lb-ft of torque. 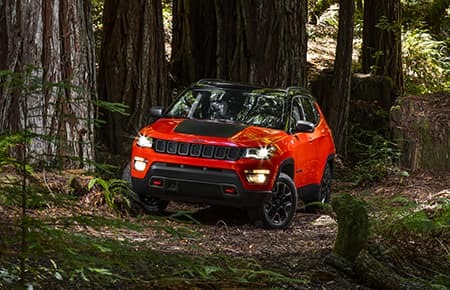 Buyers have the option of choosing a six-speed manual transmission or a nine-speed automatic transmission and when the Compass Trailhawk is equipped with the six-speed manual transmission it has best-in-class highway fuel economy of 31 mpg. All Compass 4×4 models come standard with the Selec-Terrain System, which offers four drive modes (sand, snow, mud, auto), but the Selec-Terrain System on the Compass Trailhawk is upgraded with a fifth drive mode, rock. The Compass Trailhawk also features a 2,000-pound towing capacity, hill-descent control and Jeep Active Drive Low 4×4, which gives the Jeep Compass Trailhawk a 20:1 crawl ratio. Unlike the other Compass 4×4 models that are equipped with an all-wheel-drive suspension, the suspension on the Compass Trailhawk is an off-road suspension and it raises the Compass Trailhawk’s ride height by nearly one-inch and gives the Compass Trailhawk up to 19 inches of water fording, a running ground clearance of 8.5”, a breakover angle of 24.4 degrees, a departure angle of 33.6 degrees and an approach angle of 30.3 degrees. The Compass Trailhawk comes standard with 17-inch off-road tires and 17-inch polished black aluminum wheels. To protect some of the vehicle’s most important equipment from being damaged by water, debris or other objects while off-roading there is a front suspension skid plate, a fuel tank skid plate, a transfer case skid plate and a transmission skid plate. 2018 Jeep Compass Trailhawk 4×4 has a starting MSRP of $28,695 (plus destination fee). was introduced to the Jeep lineup in 2015 and it’s compact size makes it a great SUV option for people that want an SUV that can maneuver easily in tight city streets, but want an SUV that is tough enough to handle challenging terrains when going off the beaten path. 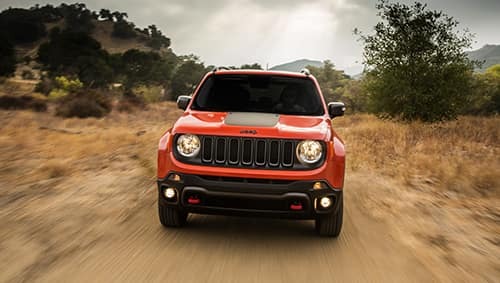 The Renegade Trailhawk comes standard with a 2.4-liter I-4 M-Air engine, 9-speed automatic transmission and when buyers opt for the available tow package, the Renegade Trailhawk has a maximum towing capacity of 2,000 pounds. Like the Compass Trailhawk, the Renegade Trailhawk provides up to 19 inches of water fording, a 20:1 crawl ratio and it is equipped with a five-mode Selec-Terrain System. Other off-road features of the Renegade Trailhawk include hill-descent control, and it has a ground clearance of 8.7 inches, a departure angle of 34.3 degrees, an approach angle of 30.5 degrees, and a breakover angle of 25.7 degrees. The Renegade Trailhawk is equipped with a transfer case skid plate, a fuel tank skid plate, a transmission skid plate and a front suspension skid plate. 2018 Jeep Renegade Trailhawk has a starting MSRP of $26,845 (plus destination fee). Preparing the Cherokee lineup for a slew of new changes coming with the total redesign of the Jeep Cherokee for the 2019 model year, the Cherokee Trailhawk received some exciting new changes for the 2018 model year. As one of Jeep’s oldest models, the Cherokee is a refined yet rugged Jeep model, and the Cherokee Trailhawk has both of those characteristics in spades. The 2018 Cherokee Trailhawk comes standard with a 2.4-liter I4 MultiAir engine and nine-speed automatic transmission, but buyers can upgrade to a more powerful 3.2-liter V6 engine with Engine Stop-Start. The 2.4L engine gives the Cherokee a highway fuel economy of up to 30 mpg, and the 3.2L engine delivers best-in-class V6 fuel economy of up to 29 mpg on the highway. Unlike other Cherokee 4×4 models, the Cherokee Trailhawk is equipped with Jeep Active Drive II, Jeep Active Drive Lock and Selec-Speed Crawl Control. 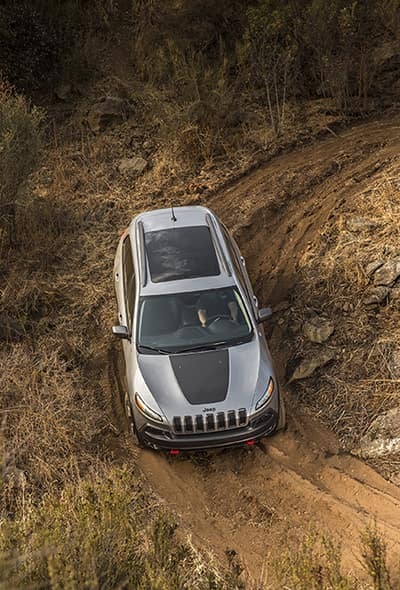 Jeep Active Drive Lock gives the Cherokee Trailhawk a 56:1 crawl ratio and the Selec-Speed Crawl Control assists the vehicle when crawling at slow speeds so it can focus its power on going up and down inclines. The Jeep Cherokee Trailhawk has a transfer case skid plate, a front suspension skid plate, an underbody skid plate, and a fuel tank skid plate shield. The Cherokee Trailhawk provides 20 inches of water fording, and it has a departure angle of 32.3 degrees, an approach angle of 29.9 degrees, and a breakover angle of 22.9 degrees. 2018 Jeep Cherokee Trailhawk has a starting MSRP of $30,995 (plus destination fees). The Jeep Grand Cherokee Trailhawk is the biggest of all four models. The Grand Cherokee Trailhawk comes standard with a 295-horsepower 3.6-liter V6 engine paired to an 8-speed automatic transmission, but buyers can upgrade to a 360-horsepower 5.7-liter HEMI V8 engine, also paired to an 8-speed automatic transmission. The 3.6L engine gives the Grand Cherokee Trailhawk a maximum towing capacity of 6,200 pounds and the 5.7L HEMI engine increases the vehicle’s towing capacity to 7,400 pounds. The Grand Cherokee Trailhawk is equipped with the Quadra-Drive II 4WD System and the Quadra-Trac II 4WD System, and both systems respond to provide wheels with more torque and traction when wheel slippage is detected. The Jeep Grand Cherokee has a departure angle of 24 degrees, a breakover angle of 25.7 degrees, and an approach angle of 26.2 degrees. The Grand Cherokee Trailhawk is equipped with an underbody skid plate, a transfer case skid plate, a fuel tank skid plate shield and a front suspension skid plate. 2018 Jeep Grand Cherokee has a starting MSRP of $43,395 (plus destination fee). Ready to hit the trails and go on your own Jeep adventure? You can view all of the Jeep models that are available at Hollywood Chrysler Jeep online or you can come visit us and test drive our available models today.